Nokia has today announced the beta launch of its City Lens augmented reality browser app for its Lumia range of Windows Phone devices. 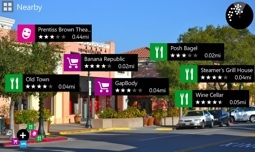 The app, already available for the company’s Symbian devices, emphasizes urban discovery, displaying nearby points of interest – like reatuarants, museums or theaters – as an augmented reality view via your phone’s camera, in a list or on a map depending on the device’s current orientation. It offers easy access to professional reviews and contact details for places listed, and lets you share them with friends via SMS, email or social networks. This is far from the only app that’s taken this kind of approach to discovering information about nearby places. Many an augmented reality app has been built around the idea. 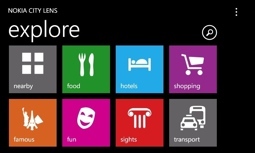 However, it looks undeniably slick, following the standard Windows Phone design cues. While the app is currently part of Nokia’s Beta Labs program and still a little buggy, it’s listed as likely to graduate to a commercial product. If you’ve got a Lumia phone and would like to give it a go, you can register for Beta Labs and download it via the link below.